Good afternoon! We have 5 spots left for this class! We are so excited to bring you our very first quilt class! 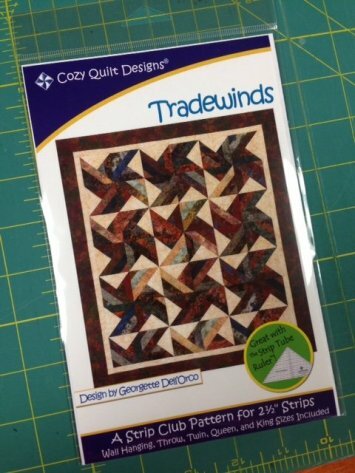 It will be a class featuring the Strip Tube ruler and pattern from Cozy Quilt Designs - Tradewinds. This class is perfect for anyone from a beginner quilter to an advanced quilter. Two kit choices will be available: batik or Kim Diehl. Sample blocks will be hung up in the shop next week! Throw 58" x 65 1/2"
We will be limiting the class to 10 students. We would love to have you join us! Call us at 308*344*9389 or email us at juststitchin2014@gmail.com to sign up today! For those who have already signed up, please call us or stop in and let us know which kit option you would like!